Classical economics is the first modern school of economic thought. Its main developers include Adam Smith, Jean-Baptiste Say, David Ricardo, Thomas Malthus and John Stuart Mill. 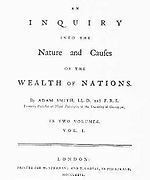 Adam Smith's book The Wealth of Nations (1776) was the beginning of classical economics. Smith said that if everyone did what was best for themselves, the result would be best for society. Before that, economics was about the king's personal interests, and the wealth of a nation was measured by the king's treasury. Smith said what's important is what's best for the whole nation, and that wealth should be measured by the yearly income of the nation. He wanted to discover how wealth can grow, and how people could do things to support that growth. Smith's book said land, labor, and capital were the three "factors of production" and the main contributors to a nation's wealth. Prices naturally adjust to having more or less of something: supply and demand. If there is too much of something (more supply), prices go down so that people have more reason to buy it. If a lot of people want something (high demand), there may not be enough of it (scarcity); there will be a competition among the people who want to buy it, and some people will agree to pay more to get what they want, and prices go up. Smith said markets should be free. At the time, some big companies (like the East India Company) were controlled by the government. Sometimes the rulers made laws that were good for themselves but not for workers or customers. For example, in the American colonies, colonists could grow cotton but were not allowed to make clothing from it. They had to ship it to England to be made into clothing, then buy it back after it was finished. Smith said this was bad for individuals and for society. He thought it was better for money to flow freely and naturally between buyers and sellers without outside interference. Money would naturally go to the sellers who made the best product at the best price. This way if people did what was best for them, it would end up being best for society as a whole, almost like an "invisible hand" was guiding everything. ↑ Blaug, Mark (1987). "Classical Economics", The New Palgrave: A Dictionary of Economics, v. 1, pp. 434–35. Blaug notes less widely used datings and uses of 'classical economics', including those of Marx and Keynes. This page was last changed on 27 August 2015, at 05:01.